“Johnny B Goode was not Chuck Berry’s first hit. He had topped the R & B charts with his first single, “Maybellene” in 1955. “Roll Over Beethoven” (1956) hit #2; “Too Much Monkey Business” (1956) #4; “School Day (Ring! Ring! Goes the Bell)” #1 in 1957. 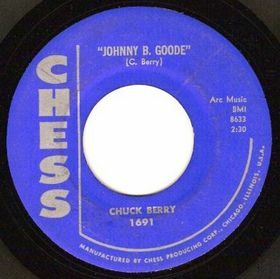 Berry wrote “Johnny B Goode” and it was mostly autobiographical. He was actually born in St Louis, not deep down in Louisiana close to New New Orleans way back up in the woods among the evergreens. But his St Louis street address was 2520 Goode Avenue. Love that trivia. It is a song about the American Dream. It is about hope. That talent will prove out. The song has become American icon covered by dozens of performers and with Chuck’s sad death on March 18, 2017 we must carry his torch. The song is ranked as number seven on Rolling Stone magazine’s list of “the 500 Greatest Songs of All Time. Many write of the similarity of Johnny B Goode’s opening to Louis Jordan’s “Ain’t That Just Like a Woman.” You can decide. Berry’s recording of the song was included on the Voyager Golden Record, attached to the Voyager spacecraft. 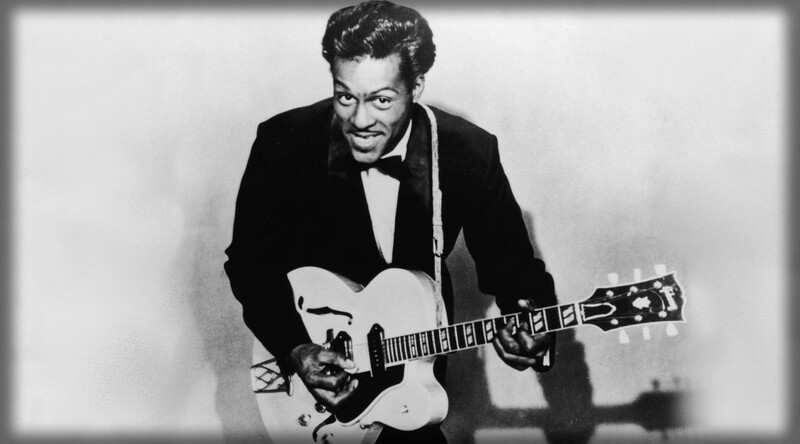 Chuck Berry was inducted into the first Rock and Roll Hall of Fame on January 23, 1986. While no individual can be said to have invented rock and roll, Berry arguably did more than anyone else to put the pieces together. As rock journalist Dave Marsh wrote, “Chuck Berry is to rock and roll what Louis Armstrong is to jazz.” On “Maybellene” – Berry’s first single, released in 1955 – he played country & western guitar licks over a base of rhythm & blues. The distorted sound of Berry’s guitar captured the rough, untamed spirit of rock and roll. The song included a brief but scorching solo built around his trademark double-string guitar licks. It kicked off Berry’s career in style and paved the way for a steady stream of classics over the next decade. Some songs are hits and that’s that. 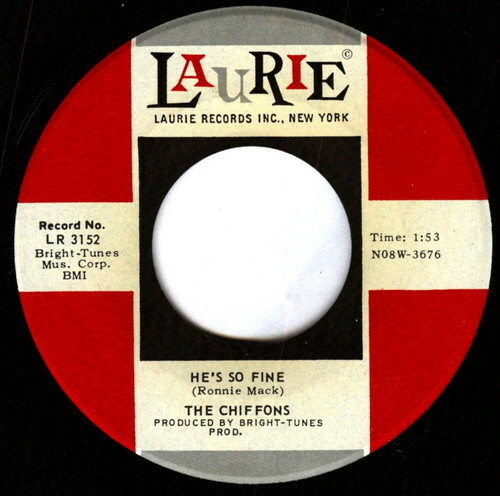 “He’s So Fine” by the Chiffons was a #1 hit and that was that for many years. We’ll get to many years in a moment. 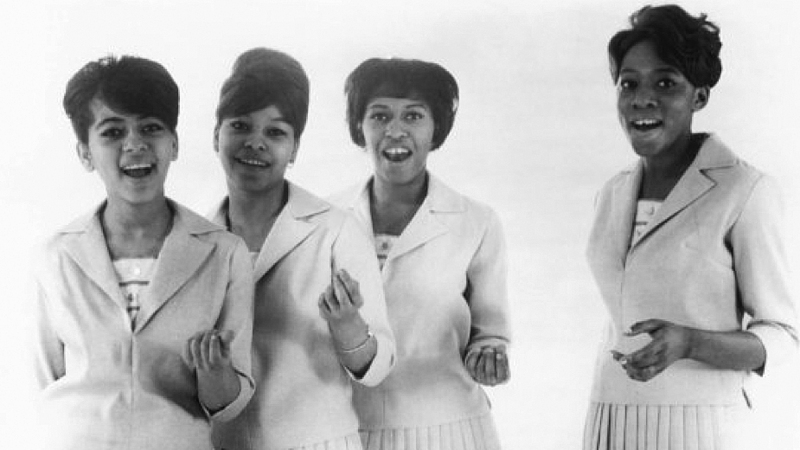 The Chiffons were at first a three-girl group [Judy Craig, Patricia Bennett, and Barbara Lee]. All attended James Monroe High School in the Bronx, NYC. Ronald Mack wrote the song, was familiar with the group, and felt that they, and at his suggestion the addition of Sylvia Peterson, would be an ideal match. Bright-Tunes Corporation recorded the song. The Tokens, famously had the hit “The Lion Sleeps Tonight” in 1961, owned Bright-Tunes and performed the music. Mack could not find any label to release the song until Laurie Records enthusiastically said yes. Laurie released the song in December 1962. On this date the song hit #1. In 1970 George Harrison released the song “My Sweet Lord” his first single as a non-Beatle. The song did very well. In fact that year the Recording Industry Association of America (RIAA) certified it gold by the for sales of over 1 million copies. Did Harrison deliberately use the music of He’s So Fine? I do not believe he did so deliberately. Nevertheless, it is clear that My Sweet Lord is the very same song as He’s So Fine with different words, and Harrison had access to He’s So Fine. This is, under the law, infringement of copyright, and is no less so even though subconsciously accomplished. The Chiffons released their own cover of “My Sweet Lord” in 1975. Harrison’s “This Song”  is all about the argument. 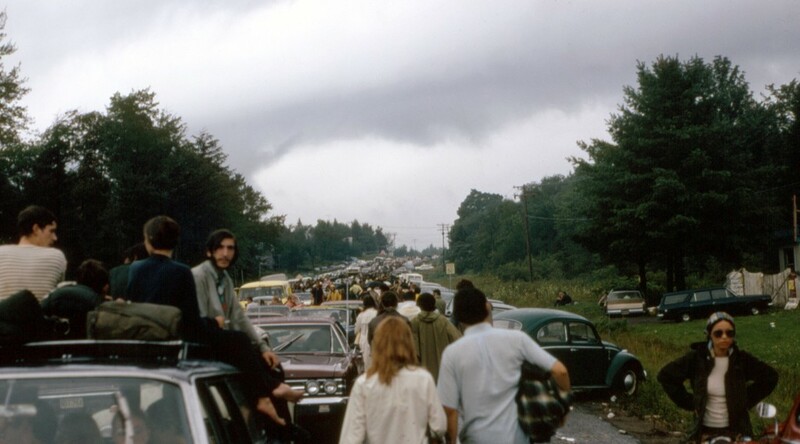 Many people visit the town of Woodstock, NY to find Max and Miriam Yasgur’s farm because the oft told, but inaccurate, story: that is where Woodstock was. Another inaccuracy is that the town of Woodstock denied Woodstock Venture’s request to hold it in the town itself. Keep in mind that Michael Lang and Artie Kornfeld’s original idea (one that Kornfeld has said was actually his wife’s idea) was to create a recording studio in Woodstock. Many musicians lived in, near, the often visited the town. Though Bob Dylan was the most notable among those musicians, Bob’s band, The Band, was there of course and others included Janis Joplin, Richie Havens, Paul Butterfield, Van Morrison, John Sebastian, and even Jimi Hendrix. Lang and Kornfeld had proposed the studio idea to John Roberts and Joel Rosenman in early February. In a month, things happened quickly regarding the festival’s site. March 29, 1969, Michael Lang had found a suitable site in Saugerties, NY right off the NY Thruway. On this date, John Roberts and Joel Rosenman met with a Mr Holmes, the lawyer for the site’s owner, Mr Shaler. The lawyer emphatically told Roberts and Rosenman that the site was not for rent for such a purpose. 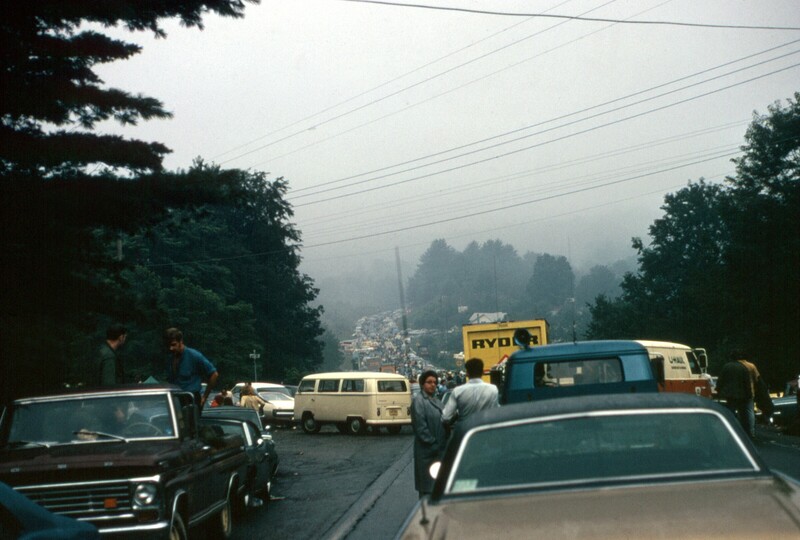 March 30, 1969, after the Saugerties refusal, Roberts and Rosenman spoke to Howard Mills about a piece of land in Wallkill, NY that Mills was going to develop. Mills agreed to rent the site for the festival. You will notice that the town of Woodstock was not part of the festival’s picture. 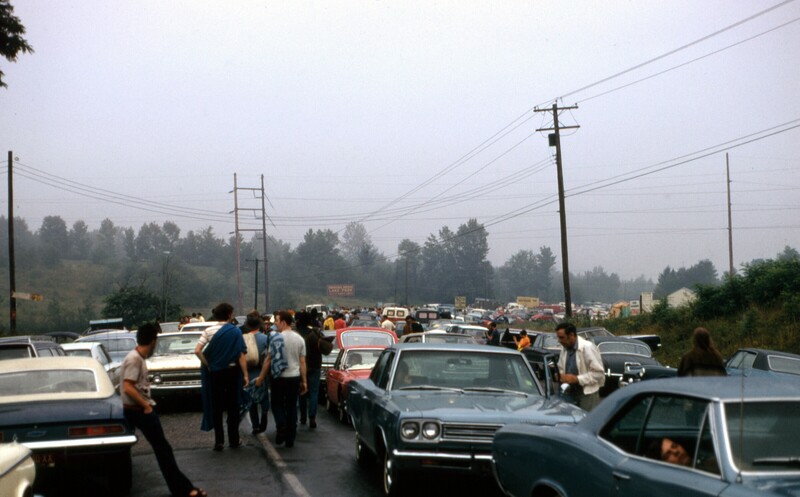 It did not “refuse” or “kick out” Woodstock Ventures. And the owner of the proposed Saugerties site simply refused.